With tax season mostly behind us (hopefully you at least filed for an extension) this is the perfect time for me to remind everyone to spend some time and re-evaluate their tax strategy for 2010. Trust me, there’s a reason that wealthy individuals spend more money on tax planning rather than preparation. Filling out a 1040 is the easy part. That being said, one of the easiest ways to control your bill from Uncle Sam is to re-visit the number of exemptions you’ve elected on your W-4. If you’ve been consistently employed for the past few years chances are you haven’t bothered to revisit your W-4 exemptions since being hired. But with many employers allowing you to update your W-4 online there’s no excuse NOT to. First, the basics. Your employer is going to withhold something from your paycheck based on standardized graduated withholdings set by the IRS. The IRS calculates this withholding based on what it thinks you will owe at the end of the year so that you’re not hit with a huge tax bill in April. In a perfect world the amount withheld from your paycheck each pay period would equal the amount of taxes due. At the end of the year the IRS wouldn’t owe you a dime in refunds and you wouldn’t owe Uncle Sam anything either. The problem is that our tax situations are all different. You may have 12 kids, or you may donate $50,000 to your favorite charity this year. The IRS can’t predict these tax events for you – so you have to give the IRS a bit of help by filling out your W-4 correctly. 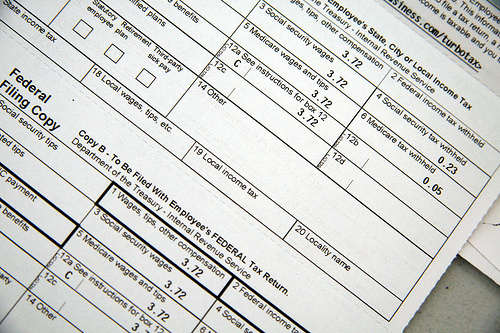 For every exemption you take on your W-4, you decrease the amount withheld from your paycheck. If done correctly, you could end up with more cash in your pocket throughout the year. If done incorrectly, you’ll end up writing a check to the government. In either case, Uncle Sam will demand his pound of flesh. Hopefully you now see why now is the perfect time to re-visit your W-4 exemptions. Based on the check you just wrote or received, you can adjust your exemptions so that you can improve your monthly cash flow. As I mentioned in an earlier post (How Many Deductions to Take on Your W-4) there are a few online calculators to help you determine what the appropriate number of exemptions is. However, if you don’t want to worry about the number of exemptions you can always write in an additional amount you’d like withheld. Now that you’re a little more educated about your W-4 go out there and take charge of your tax planning! Funny that 3 years later, I’m asking myself the same question that prompted the first post! I’m in my “real” job now and already made adjustments based on my return a few months back. The extra cash each month has been nice let me tell you. I may go back later this week or month and adjust some more since we have another kid coming and purchased a home. However, I’m tempted to wait until next tax return to do that after seeing a full year’s worth of income (graduated and started full-time in June). This site helped me to know how many more exemptions to take on my federal and state return.